As you can see from the above screenshot, the Zen 6.x-1.1 download will be 243 KB slimmer with the removal of this crufty sub-theme. Of the remaining KBs in the download, over half of the size is Zen’s Photoshop files, the source files for the images used in Zen. This is open-source software, people! You’re supposed to include the source files. Ok, I guess that’s the end of my mini-rant. lol. As with any Zen release, I want to sincerely thank all the people who contributed to make it better. Take a look at the CHANGELOG to see the full list. 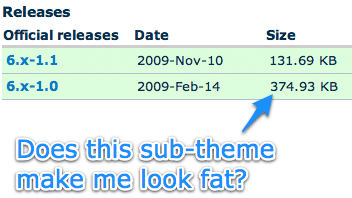 If you are interested in why Zen Classic was removed, you should take a look at the issue in Zen’s queue, “Removed Zen Classic sub theme”. If i have to use zen classic theme, what should i do now?